Last Friday, I had the pleasure of joining new-to-me jewelry designer, Brandy Pham, for lunch at The T Room! Having just moved to Dallas from New York after living there for seven years, I wanted to take her to my favorite weekday lunch spot to give her a warm welcome to Texas. She is such a sweetheart and her pieces are beautiful – all of her jewelry is handcrafted in New York, New York. Brandy was kind enough to gift me with a piece from her current collection, which happened to be this needle bracelet you see here. The needle design is unique, but it’s classic enough to wear everyday and layer with your other favorite bracelets and cuffs. I’m super tempted to add the double needle ring and these needle bar studs to my collection – they’re so simple and understated, but different and unexpected. Click here to check out more of Brandy’s beautiful pieces! Tibi is offering 20% off select fall pieces – since Tibi is always a go-to for me, I know I’m going to buy a few things. What’s on my list? This felted wool cape, these heels, and this jacquard midi skirt. Click here to shop the selection and enter code HELLOFALL at checkout to save! Take an extra 20% off these style steals at Matches Fashion until Friday! This embroidered-heart Stella skirt is too gorgeous to pass up, don’t you think? Since we’re talking skirts, this Carven zebra-print mini is très adorable, as well as this perfect-for-fall green Giles A-line skirt. Click here to shop the sale, and enter EXTRA20 at checkout! J.Crew is back with another awesome sale! Enjoy 25% off site wide – eek! I just bought this burgundy leather baseball cap and this lace-accented sweater. Some other pretty autumn picks include this houndstooth schoolboy blazer, this shirttail sweater and these broken-in boyfriend jeans. Don’t forget about jewelry! Click here to start shopping and enter code ALMOSTFALL at checkout. Enjoy an extra 40% off sale items at Rebecca Taylor, for savings of up to 75%!! My recs include this pretty pleated Chartreuse frock, this sleeveless lace peplum gown (stunning! ), this navy silk chiffon dress and this plum blazer for fall. Also wouldn’t mind owning this pieced blouse! Click here to shop the sale and enter code RT14LD40 at checkout. These sunnies are awesome! I need me some Celine’s next. I love this look. Unique hems make even the most basic thing standout. In love with this outfit! 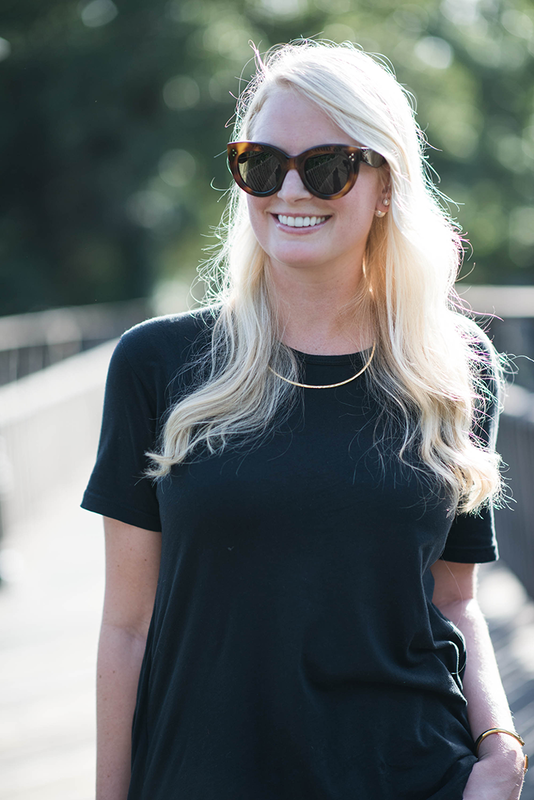 Obsessed with tunic tees lately! Cutie pie! Love the laid-back look. those sunnies are to die for. 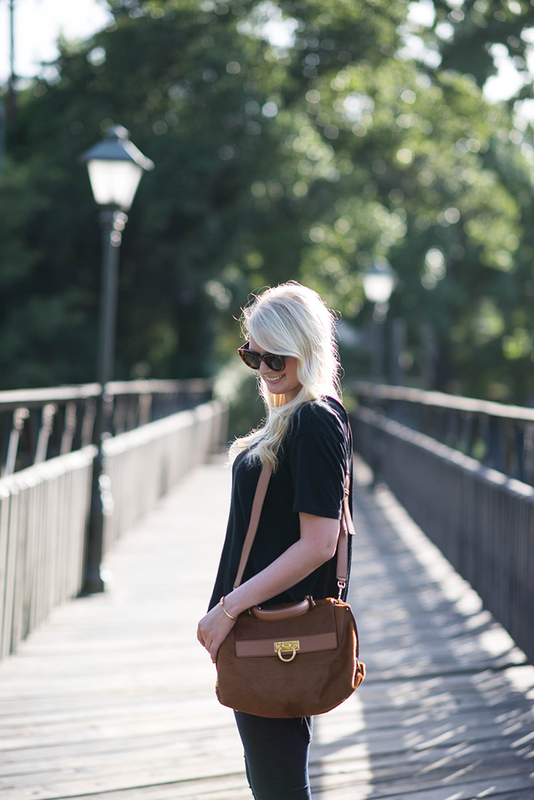 Your hair looks amazing…love your bag and those skinnys are perfection. You look amazing, pretty lady! Nice shades. I like Brand Pham pieces, especially the “Lovely” collection…it’s on my pinterest craving board. 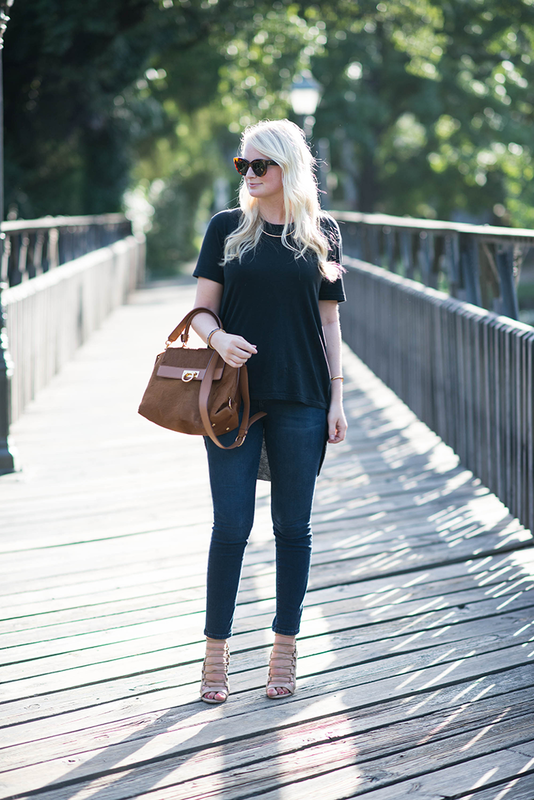 This is such a great casual look! New sunnies and new bag? The photos turned out so pretty! Love this outfit! Lookin’ good Merritt! Love those heels!! That Ferragamo bag is beautiful!! I love the detachable strap so you can wear it a number of ways! 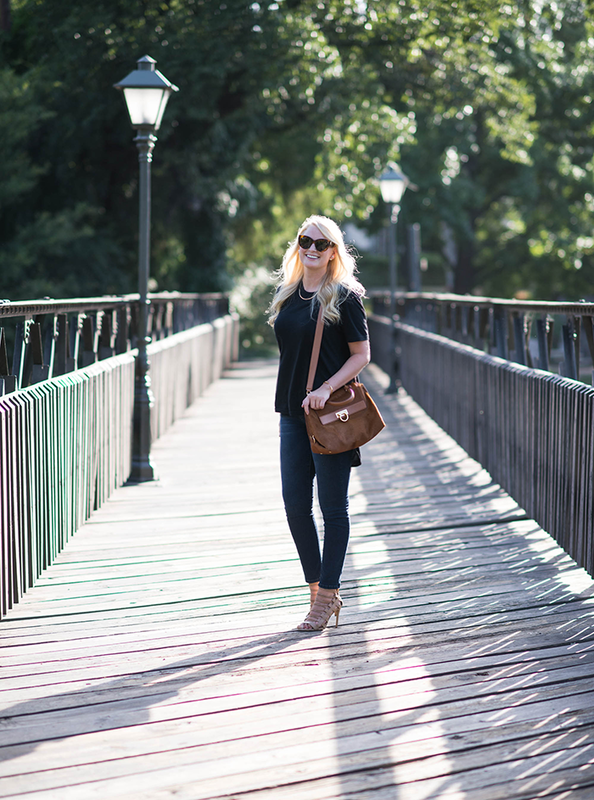 Love this hi-lo top! Very chic look. Love Brandy Pham pieces, that necklace is lovely. 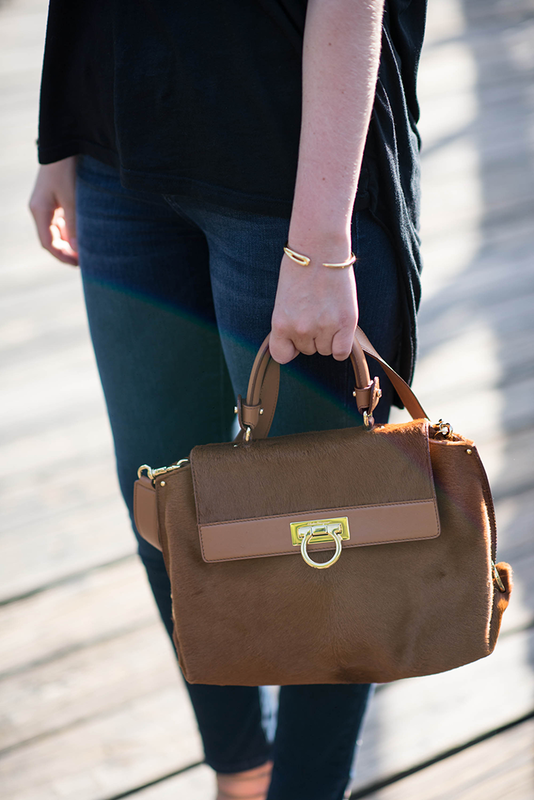 PS – dying over your Ferragamo, so perfect for fall! you are such cuteness, lady! just booked my flight to nyc for next week… hope to see you! ps: these sales are DANGEROUS. so simple, but so perfect! I loveeee that bag! 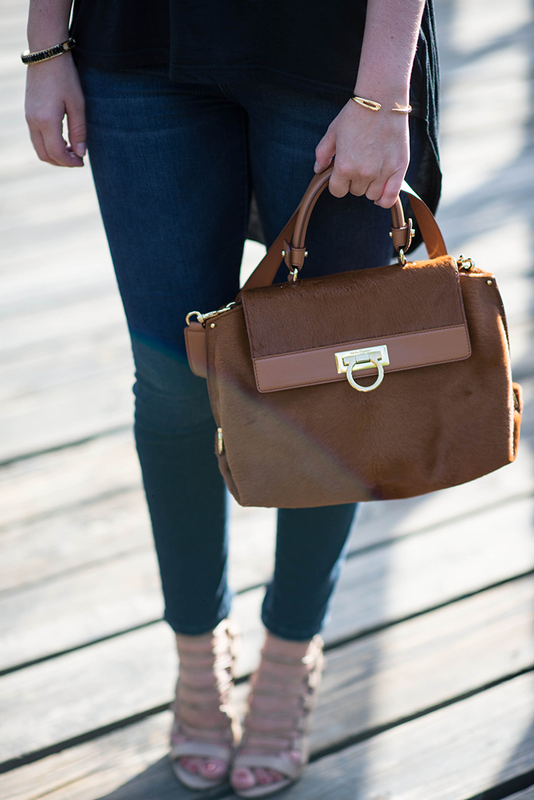 Love this dressy casual look! The shoes are amazing! Love the cut/shape of that top!